Beckford Silk Scarf in the Arts and Crafts Style Designed by Gunilla Treen - who is also known as a jeweller. Designed by Gunilla Treen is printed on the scarf along with the Beckford Silk Label. Excellent Condition. Very arts and crafts in style. Fabric : Polyester (floaty, semi-sheer). Size : approx: 23" Square. 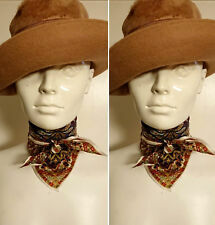 Vintage 1970's Red/Blue/Cream Paisley Square Head/Neck Scarf. It has a wonderful blue, red green and cream paisley on a polyester material. 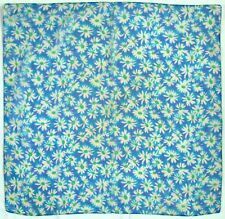 This is a super cute square scarf from the late 1970's. A wonderful accessory to help you achieve many looks and trends. 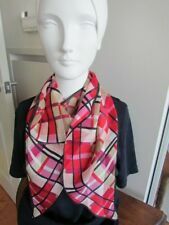 Ladies 70s vintage scarf in pleated fabric Burgundy red and cream. 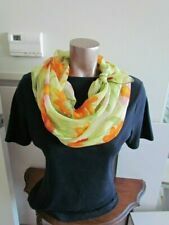 Original vintage item Small scarf, would make a good neckerchief or hairband. Measurements 18" square Condition- very good. Few pulled threads . Nothing major. Your beautiful item will come to you carefully wrapped and sent via Royal mail fully insured. FABRIC ~ Silky and floaty polyester. DATE~ Orignal 1970s. ITEM~ Scarf. COLOUR ~ Brown with a floral print. We have a passion for tailoring, prints and individuality. Size : approx: 30" Square. 100 % silk. See the 4th photo, light spot. made in West Germany. Machine turned edges (one edge is selvedge). Size : approx: 27" Square. Fabric : Cotton. Cream, very dark blue and mid brown. 46" x 46". 100% acrylic. Made in Italy. 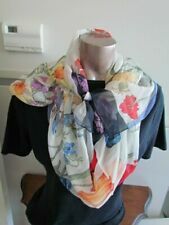 Ladies vintage silk scarf in earthy beige, blueand brown Country bird and woodland design Wear one hundred and one ways. Measurements 29" square Condition- good. Few pulled threads . Nothing major. Your beautiful item will come to you carefully wrapped and sent via Royal mail fully insured. Creamy white with navy blue/indigo monogram at each end. This is a silky manmade fabric, possibly rayon. Pretty green floral botanical pattern. ITEM~ Shawl. DATE~ Original 1970s. COLOUR~ Navy blue with stripes. FABRIC ~ Acrylic. ITEM~ Shawl. DATE~ Original 1970s. COLOUR~ Purple with a white stripe. FABRIC ~ Acrylic. make Supersized seem small. ITEM~ Shawl. DATE~ Original 1970s. FABRIC ~ Acrylic. COLOUR~ Blue and black. ITEM~ Shawl. DATE~ Original 1970s. COLOUR~ Yellow, green and brown stripes. make Supersized seem small. ITEM~ Shawl. DATE~ Original 1970s. FABRIC ~ Acrylic. COLOUR~ Brown with stripes. Get images that. make Supersized seem small. FABRIC ~ Silk chiffon. DATE~ Orignal 1970s. COLOUR ~ Grey with a large painted butterfly. ITEM~ Scarf. COLOUR ~ Red and black daisy print. DATE~ Orignal 1970s. ITEM~ Scarf. FABRIC ~ Floaty polyester. Auctiva's FREE Counter. We have a passion for tailoring, prints and individuality. DATE~ Orignal 1970s. ITEM~ Scarf. COLOUR ~ Purple with a paited floral print. FABRIC ~ Silky polyester. We have a passion for tailoring, prints and individuality. ITEM~ Scarf by Monique Valery. DATE~ Orignal 1970s. COLOUR ~ Cream with a brown floral print. FABRIC ~ Silky polyester. We have a passion for tailoring, prints and individuality.